This webcast will provide a demonstration of the Riverbed, Veeam and Windows Azure cloud backup solution. 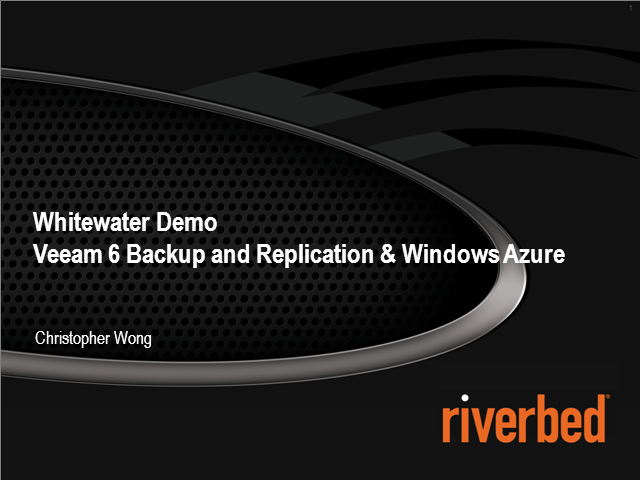 See how to configure the Riverbed Whitewater cloud storage gateway with Veeam Backup and Replication V6 to quickly and easily store backup data sets in the Windows Azure cloud. Join our webcast for the unveiling of Riverbed SteelFusion™, the only branch converged infrastructure solution on the market. It’s an innovation like no other that will allow you to transform your branch IT architectures, economics and productivity. -Converge standalone servers and storage onto a single branch platform. -Reduce branch complexity by moving data at the edge into the datacenter. -Eliminate branch downtime, improve data security, and lower TCO. Branch offices are critical to business, but the usual approach to branch IT leaves you at risk of downtime and thus impact to users and revenue. It's now possible to execute services in the branch delivered from the data center, to speed provisioning and recovery and ensure branch business continuity. Join Riverbed Technology experts as they discuss real-world case studies of how businesses in industries that depend on remote offices have successfully transformed IT at the edge. Join this free webcast to learn how you can eliminate branch office data protection with Riverbed Granite while maintaining local LAN speed performance. Join this live webcast where we will announce new Whitewater cloud storage gateways, along with key partners that will change the economics of data protection. Find out how organizations can simultaneously streamline data protection, improve disaster recovery readiness, and reduce operational costs by up to 80%. This webcast will cover core security concepts, teach you how to implement a security policy and explain what security controls are available in the public cloud today and how to leverage them. Streamlines IT, Creates a new low cost storage tier, improves DR without the costs of a recovery site, improves RPO and RTO and allows recovery from any location with an internet conection. Join this webcast to learn how to improve disaster recovery readiness and reduce risk with the public cloud. Identify business requirements, choose the right DR architecture and leverage your existing backup application with cloud storage gateways to assure recovery should the unexpected occur. Join this webcast to learn how Whitewater cloud storage gateways improve DR, eliminate tape and streamline data protection without changes to the existing backup infrastructure. Join this demonstration of Symantec Backup Exec, Amazon S3 cloud storage and Riverbed's Whitewater cloud storage gateway working together to modernize data protection. This webinar will highlight the setup and configuration of the system and show how fast and easy it is to store Backup Exec data in the Amazon S3 cloud. This webcast will discuss the architecture, advantages and how to implement tapeless cloud backup leveraging Symantec Backup Exec, Riverbed Whitewater cloud storage gateways and Amazon Web Services.